In this paper, we argue for cross-pollination between the discourses of cultural studies and phenomenology in the exploration and description of the embodied relations effected by contemporary digital media. After surveying literatures on both embodiment and cultural studies, specifically those that address auditory experience and the particularities of listening culture, we propose a case for developing a cultural phenomenology of technologically mediated aural practices. This functions as a point of departure for negotiating the notion of embodiment as a culturally contextualised inquiry – one that is reconfigured according to the prevalence and use of contemporary digital media. Some of the main contributions of this work lie in the coalescence of disparate, yet worthwhile and relevant sets of literature, which provide the groundwork for the development of a context sensitive, experientially-oriented ethnography of embodied aurality. Over the last decade or so, there has been emerging scholarly interest and development in the study of audio technology (Bijsterveld, 2008; Katz, 2004; Dyson, 2009), aural culture studies (Bull & Back, 2003; Cox & Warner, 2004), and the phenomenology of listening (Erlmann, 2004; Augoyard & Torgue, 2005) to mention only a few. Particularly, within the context of mediated communication, the study of mobile audio has taken great strides, both in the areas of technological innovation and interaction design, as well as in its application toward artistic, social, musical, and other trans-media “convergence culture” practices (Jenkins, 2006). However, there remains the opportunity to further media studies and the sociological orientation of work on the experience and use of mobile audio devices, in particular, by engaging the paradigms of sensory ethnography and the phenomenology of embodiment. We aspire to contribute to this important body of knowledge by developing and exemplifying the conception of embodiment as a dynamic socio-cultural notion; one that is increasingly cultivated by the nature of technologically mediated practices, simultaneously engendered through a dialogue with cultural experience and place. In this setting, the very notion of embodiment assumes an active position, and as such, must be continuously contested and grounded in the specificity of socio-cultural practice. By extending the cultural aspect of phenomenology to micro-cultures across global ethnic and socio-economic conditions, there emerges a manner in which to develop a more thorough and detailed account of the modern technological experience. We attempt to illustrate this theoretical synthesis with an experiential account of mediated soundwalking – a practice traditionally associated with the field of acoustic ecology – as a way of demonstrating how notions of embodiment become manifest in particular micro-cultural contexts of aural mediation. A notion of mediated aural embodiment that resides at the intersection of sensory ethnography and cultural studies must at some level be informed by a phenomenological approach, both as a methodological paradigm and as a way of understanding situated experience. Inspired by Maurice Merleau-Ponty’s phenomenology of perception (1962), Don Ihde’s auditory phenomenology (1976) attempts to explicate sound’s ontological characteristics as an inventory of foundational pre-conceptual sensations and effects, unique to an aural subjectivity. Beyond Walter Ong’s psychodynamics of orality (1982), Ihde is interested in the profound vibratory effects of sound on our embodied perceptual sensibilities, which frame so much of what we understand sound to be conceptually, and as such, how we use and encounter it in daily life (Ihde, 1976). His comment that “…all sounds are in a broad sense ‘voices’, the voices of things, of others, of the world” (1976, p.147) hearkens to a notion of sounding and listening as fundamentally physical interactions within an environment – a voicing, an outward vibration. In a more recent text that extends Ihde’s ideas of aural corporeality and tactility, Jean Luc Nancy goes further by suggesting that sound is like touch, or in fact is touch – with its force and oscillations literally vibrating through our bodies and the objects of the world (Nancy, 2001, p.27). Nancy describes sound as methexis (participation), while vision as mimesis (imitation) in order to expand on the notions of echo, resonance and timbre in phenomenological terms (Nancy, 2007, p.8). Echo, then is the property of sound to constantly refer back to itself, while resonance, which Nancy claims is the quintessential nature of meaning vested in sound, reflects the simultaneity of sounding and listening – for they happen at the same time and implicate each other in a form of “contagion” (2007, p.42). Perhaps forging a tenuous relationship to orality in its stance for the primacy of verbal utterance, Nancy posits that sonorous communication is “not transmission, but a sharing that is already a subject” (2007, p.42). Thus, the centrality of an aural subjectivity is enacted through interpersonal participation, exchange, and communion within the surrounding [cultural] context. Maintaining the philosophical trajectory established by Merleau-Ponty, both Ihde and Nancy conceptualize sound as fundamentally embodied; an oscillation, a tangible horizon of experience, a resonance that connects our bodies with the external sonic environment. Yet, the dynamism and character of the soundscape, and the manner in which it configures aural experience, cannot be overstated. It not only fluctuates from moment to moment, but also, and perhaps more significantly, the acoustic environment takes on an entirely distinct character in divergent spatial and socio-cultural contexts. We must therefore not only account for, but also emphasize the specificity of a given soundscape, whereby meaning is always negotiated by an embodied presence in a local context; an ecology, comprised of the exchange between soundscape and listener. It is that relationship between embodied aural experience and the spatio-temporal contingency of the soundscape that begins to address the positionality of the listening subject. The purpose of employing a phenomenological discourse extends beyond mere description of the attributes of aural experience. Rather, by exploring the manner in which the body engages in dialogue with the surrounding environment, we cultivate the opportunity to better negotiate the positionality of the listener. Here, not only can we address one’s personal perceptual behaviour, tendencies, and disposition toward sonic experience, but we can also construct an impression of the social and cultural framework of the subject. That is to say, the propensity for the individual to engage the sonic environment hinges upon one’s own history with sound, and the manner that the aural modality has been cultivated according to the context in which the subject is situated. In this sense, the embodied aural response between the individual and the environment represents a site of convergence between the identity of the listening subject and the broader socio-cultural milieu. Sensory anthropologists have for some time employed the nature of sensory experience as a point of departure to inquire about the specificity of social and cultural organisation. Scholars such as David Howes (2005), Kathryn Linn Geurts (2002), and Constance Classen (1993) among others have contributed to a new regime of research that seeks to address the manner in which the body articulates the central tenets of a cultural framework. 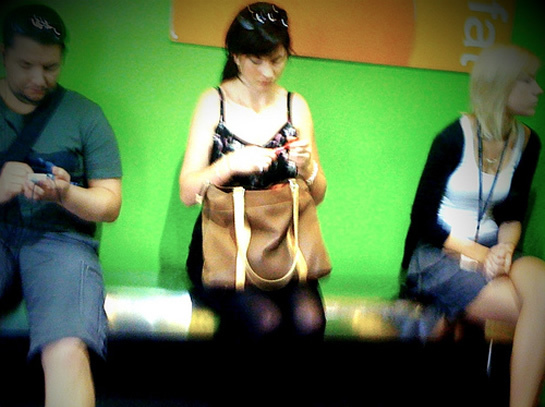 While unmediated social behaviour remains a fundamental pursuit of such an approach, the introduction of specific communicational devices (mobile technologies in particular) have contributed layers of complexity to this endeavour, having altered not only the primary means of communication, but also the role of the body as a site of socio-cultural expression. Given that the very notion of the listening subject in modernity is one that is largely cultivated in mediated environments, its precise nature can only be addressed once the integration of particular technologies amidst a social and cultural terrain is considered. Rather than conceptualise both perception and corporeal experience in a single manner (one that is fixed and exclusive) we must begin to consider the notion of embodiment and embodied practices as dynamic, insofar as they are socially, culturally, and historically contained. The notion of a cultural phenomenology is developed with rigor in the work of Thomas Csordas, who maintains that such a project is concerned with “synthesising the immediacy of an embodied experience with the multiplicity of cultural meaning in which we are always and inevitably immersed” (Csordas, 1999, p.143). In this sense, Csordas not only acknowledges, but places particular emphasis upon the experiential and epistemological orientation of the subject, bearing in mind both the personal and cultural history that frame sensory perception. This is to say, the manner in which the subject perceives, interprets, and thus generates meaning is done so through a process that is context-sensitive. Thus, the potential to more fully and accurately situate aural practices and the conception of the body in light of the design and employment of contemporary mobile technologies, resides in a phenomenological approach that remains mindful of the capacity for a cultural context to inform the nature of sensory experience. Among the many modes in which the body can be conceived, we must extend beyond perceptual experience, to touch on the very limits of corporeality. Our account of the physical self therefore also considers interpersonal dialogue a necessary constituent of subjecthood, and that the communicative medium through which it is effected informs and reconfigures the positionality of the perceiving, feeling, thinking body. How do we then embody, as cultural subjects, the dialogue between our sonic environment and mediated aural practices? In the context of comparative media studies and digital culture theory, embodiment often serves as a springboard for discussing the physical, as well as epistemological hybridisation of identity through digital technologies, particularly virtual computer worlds. Drawing on and building upon Donna Haraway’s now classic text A Cyborg Manifesto (1990), Frances Dyson posits this technologised type of embodiment as “cyborgian” and post-human, possessing a new type of cultural consciousness, forever marked by the mediation of technologies and physical extensions (Dyson, 2009). Her discussion concerning virtual space as a new realm for the performance of identity and embodiment brings perhaps the most pertinent distinction into light: that the embeddedness of “old” media compared with the mediated nature of virtual and wireless existence marks a transition from “looking at” to “being in”. In other words, while old media such as radio, television, and film (among others), afford a representational relationship between identity, context, and embodiment; virtual space, artificial intelligence, and wireless technologies offer, or rather necessitate, a participation on the part of the subject, thus inscribing a new subject: a hybrid between a real self and a digital self (Dyson, 2005, p.96). Such a hybridisation is perhaps the very starting point of conceptualising a mediated aural embodiment. By placing aural practices under consideration – aurality being a phenomenal state that is profoundly embodied – we want to characterise the experiential properties of mediated aural practice as it constitutes and constructs not only particular iterations of embodiment but particular [inter] subjectivities. There are indeed important distinctions between studying the representational qualities of technology and exploring its phenomenological implications in material-semiotic ways. Arguably, such distinctions transform embodiment in a discursive sense – that is, they extend and develop the theoretical conceptualisations of the nature of embodiment (Dyson, 2009; Hemment, 2005). Additionally, a growing body of literature specifically addresses a socio-cultural understanding of auditory embodiment, regarding it as a situated, emplaced practice (Bull, 2000; Ito, Okabe & Matsuda, 2005; Katz & Aakhus, 2002). Further, artists, academics and researchers alike continue to challenge mediated embodiment by engaging in transgressive design that leverages the meditational affordances of mobile technology into art practice, social networking, media convergence and play (Gardner, 2008; Werschler, 2008; Schroeder, 2008). What is thus unique and fruitful about the approach to mediated aurality that we elucidate here is conceptualising embodiment as a dynamic co-construction of both phenomenal corporeality and a cultural, communicative context. Essentially, we attempt to synergize three perspectives: digital humanities and its concern with the way machines re-constitute the body; cultural studies focusing on entire systems of mobile communication transforming the cultural character of communities; and finally, sensory ethnography, which addresses how embodied, socio-cultural practices are expressed through the phenomenology of a participatory corporeality. Taking a random count in any bus or metro, study room or coffee shop, reveals a familiar picture; an all-too-frequent trope of our urban, consumer culture: headphone-covered ears, glazed-over looks, and heads bent down intently engaged in thumbing over smart phones or other portable devices. Mobile audio technologies – in particular cell phones, and their newest counterpart in the form of the smart phone – comprise an increasingly significant mode of communication in the West, and are a continually growing cultural phenomenon in the developing world. Many regions of the economic south have in recent decades acquired wireless and cellular networks sometimes instead of, or in the absence of landline telephone infrastructure (Plant, 2002, p.75). There is little doubt that such proliferation and popularity of mobile audio devices is not only changing the nature of interpersonal communication, but also aural cultures, cultural practices, as well as notions of embodiment and inter-subjectivity in general. As evidence of that phenomenon, we turn to a growing body of literature that employs an ethnographic and anthropological approach to explore the manner in which mobile phone/audio use is integrated into a particular socio-cultural fabric – specifically as it plays out in highly particularised cultural, economic, and political settings. (Katz & Aakhus, 2002; Ito, Okabe & Matsuda, 2005). Building on Sadie Plant’s international comparative ethnography of the cell phone (2002), Ito, Okabe and Matsuda’s cultural phenomenology of mobile phones in Japan offers an account of a socio-cultural environment where the relationship to technology is deeply rooted in fetishisation and reliance upon personal devices. The phenomenon of keitai1, particularly expressed in contemporary youth culture, bears witness to these socio-cultural undercurrents, which shape and mitigate inter-subjectivities, cultural identity, and mediation in Japanese society. In social contexts with a more recent history of mobile technology use, particularly ones that tend to be more communally-oriented, personal devices tend to operate as social lubricants, rather than immersive communicational conduits or escapism into personal worlds (as they arguably do in the West)2. The multitude of ethno-specific cultural sociologies of the cell phone continue to emerge as an area of scholarly interest, with a focus largely upon the manner in which cell phone use re-configures public-private domains and the sphere of mass communication (Kavoori & Arcenaux, 2006). It could be argued, however, that while these accounts link such usage with cultural expression and the rituals of particular socio-ethnic realities, they neither address in any explicit sense the acoustic properties of the cell phone, nor the material manifestation of embodiment engendered by such devices. In other words, portable audio devices such as the mobile phone are discursively developed as meditational technologies transforming inter-subjectivities inside particular socio-cultural groups, however the manner in which embodiment is enacted, and the auditory significance of mediation, are much less present. The electrification of the soundscape and mass transition to an increasing reliance upon mediated forms of communication have long spurred cultural critique, pre-empted by what may be perceived as urban alienation and lack of connection with the surrounding natural environment. Acoustic ecology constitutes one such critique, which entails a model of the sonic environment that treats discrete sounds as elements of an ecology, one that is continually seeking a state of balance (Schafer, 1977). Naturally, audio communication technologies transform the nature of such an ecology by allowing surrogate environments, amplification, and sonic personalization to exist within shared soundscapes. Acoustic ecology is not only a response to rising noise pollution, but also a practice geared toward revitalizing our sensitivity to the soundscape by extending and sharpening our perceptual auditory abilities. The practices of “ear-cleaning” (Schafer, 1977)3 and soundwalking (Westerkamp, 2006; McCartney, 2005) are designed to address both urban alienation and habituation to noise through active listening techniques. Yet, in both the authors’ experiences, each younger generation of listeners finds it increasingly difficult to leave the headphones behind, to not check text messages and social media for a time, and to focus on the surrounding environment. Effectively, to engage, interact, and most importantly, to bear witness to one’s own embodied presence has become a cumbersome and ironically counter-intuitive task. As generations of consumers are increasingly accustomed to experiencing their own physicality through mediated aural practices, the contemporary listening subject now seeks both comfort and solace in the experience of mediated aurality. Thus far, we have employed cultural phenomenology as a theoretical framework, but what can be said about it as a method for exploring mediated aural practices? At this juncture, Susan Kozel’s work brings forth a phenomenologically-inspired methodology surrounding her involvement with the design of interactive embodied technologies (Kozel, 2007). Advocating a return to the lived experience, “a listening to the senses and insights that arrive obliquely, unbidden…in the midst of life”, Kozel nevertheless cautions that even subjective experience is not context-free, so phenomenology has to provide dynamics for describing the broader social and cultural dimensions of experience (Kozel, 2007 p.xvi). The particular angle she develops takes technological mediation as a central and operational point between experience and perception. That is to say, it is through technology itself that the opportunity arises to re-train our own meditative capacities, re-invigorate perception, and bring back attention to the body in novel ways, by mobilizing the sort of reflection that deepens understanding and uncovers salient patterns in the negotiation of embodiment, context, and the self. Adding to the many mobile sound projects, art installations, and performances that explore mobile audio as a geo-social occurrence, a reconfiguration of place, meaning and technologised identity4, we focus on mobile audio’s use as an ostensibly cultural performance of embodiment. To illustrate the notion of a cultural phenomenology as a method of approaching mobile audio ethnographies, we present a very specific instance of mediated aurality: a soundwalk with RjDj5 offered as an organised part of this year’s Vancouver Spring Soundwalk series6. Part of a rising genre of smart phone apps and online community of ‘indie’ developers and audiophile hobbyists, RjDj is a portal that extends the mediated listening experience on smart phones. It synthesises optional music tracks with real-time mic input and dynamic sound processing, delivered as sound “scenes”, or modules, to the user’s headphones. RjDj’s emplacement within participatory culture is also expressed by allowing users to create modules through freely distributed software based in Pure Data7. Soundtrips8 are one such module that is specifically geared toward commuters – making a trip less mundane by inviting the listener to attend to the re-mixing of typical soundscape elements such as public voices, traffic, as well as bus and metro sounds. Arguably, such experiences re-embody, through technological means, aspects of the surrounding environment, thus forming a new inter-subjectivity between the listener and the soundscape by actively encouraging a re-engagement with the aural environment rather than isolation from it. Every discrete impact, friction, and onset in a given environment becomes a compositional element, felt and heard in real-time through the device. To exemplify this, we return to the notion of a cultural phenomenology as a way of informing the character of an RjDj soundwalking experience as both an embodied and a cultural practice. Pioneers of acoustic ecology such as Hildegard Westerkamp have for decades honed the art of soundwalking, advocating its significance as both an experiential-intuitive and a formalised practice (Westerkamp, 2006; McCartney, 2005). The Vancouver Soundwalking Collective presents a very specific instance of a typically un-mediated aural practice – silent walking in small groups for the purposes of “opening our ears” and privileging the experience of listening. It involves a leader who pre-determines a route, contextualises the soundwalk to its participants, leads, and at the end of the walk, mediates a discussion about each person’s experience. In terms of the manner in which embodiment is typically constituted within this micro-culture, soundwalking engenders a connectedness to one’s bodily presence, however the experience is primarily private; listening is turned inward, and as a result, embodiment is enacted in what is largely a solitary manner. In spite of the capacity for the physicality of others to shape the nature of a walk, particularly when a group extends to upward of twenty-five participants, bodies don’t interact in any explicit sense, and in fact, there is an effort to actively minimize bodily sounds during the silent act of soundwalking. 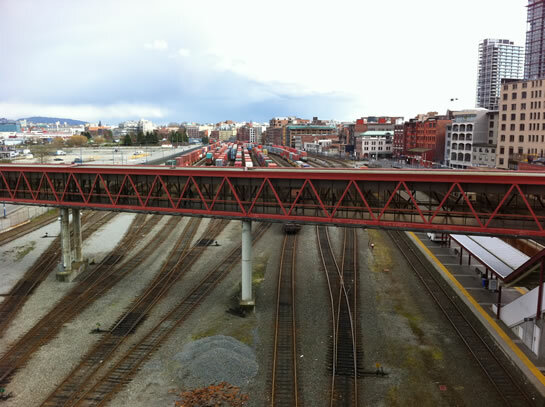 As a way of challenging and transforming typical listening experiences enacted during a soundwalk, one of the authors (both of whom are members of the Vancouver Soundwalking Collective) prepared and led a soundwalk with RjDj using a custom Soundtrip scene designed specifically for the event. Composed through the use of the company’s open source interface, RJC1000, the scene uses a variety of real-time mic input processing features (multiple delays, pitch shifts, reverberation and onset-driven textures) in order to engage and transform a multitude of soundscape elements. The soundwalk group consisted of seven participants who shared four iPods running RjDj, and the duration of the walk was approximately an hour. 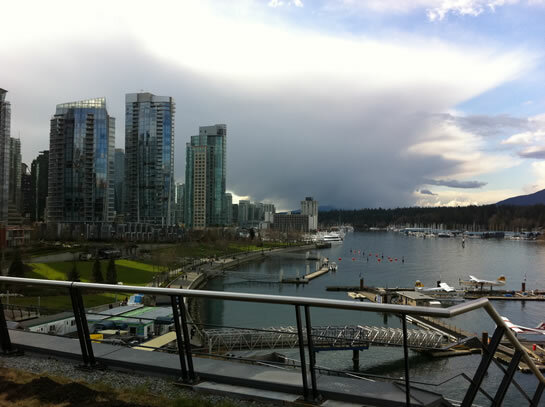 The route spanned the area between the Waterfront and the Vancouver Convention Centre, including part of the Seawall – all central downtown locations in Vancouver, British Columbia, Canada. While this experience was not a coordinated experiment by any stretch, the manner in which it undeniably re-defined our performance of embodiment throughout the soundwalk was both unexpected and fascinating in light of a cultural phenomenology of mediated aural practices. Below we offer some reflections, contextualised within the established format of soundwalking (addressed above) juxtaposed against the experiential account of this particular mediated walk. Many of these reflections emerged in our group’s debriefing discussion after the silent walking portion, during which, the affordances of the reactive software invited all of the participants to use our bodies as drum machines to elicit sounds from the environment (i.e. tapping on railings, stomping on stairs, etc.). What was particularly curious is that mediated listening became a communal experience as we all began to make sounds for one another through bodily performance and movements through space, gauging through our own perceptions how another participant might experience the effects of our soundmaking. With the realisation that sudden or loud nearby sounds would be picked up in each of our emergent dynamic mixes, we communicated non-verbally throughout the soundwalking experience, drawing attention to these sound events, sharing in this mediated, and deeply embodied aural experience. As such, the device of aural mediation became transformed in this cultural setting of “active listening” to become an extension of our ears, and a node of connection between our bodies in space, allowing us to physically partake in and engage with the soundscape. So, the fact that our group experienced it in the way that we did is, rather than incidental, critically reflective of a particular listening position that is typically associated with the headphone experience. The nature of the intersubjective aural relationships that were established, engaged, and cultivated throughout the walk, stand in juxtaposition to the conventional modes of mobile communication, insofar as the aesthetic of one’s aural environment is determined largely by the engaged physical participation of other participants in the soundwalk. This presents a contrast also to the conventional cultural practice of soundwalking as a silent, private phenomenal experience, and as such, this experience offers, by way of aural mediation, a re-organization of embodiment. The context of the fully immersive, modern digital environment imposes a particular cultural and phenomenal sensibility upon aural practices, and in turn, practices of participation and inter-subjectivity. The introduction of mobile software and listening practices mobilised by consumer-based systems such as RjDj, raise questions about what it means to be immersed in a mobile listening experience, from the standpoint of re-configuring embodiment and embodied relations. What is so striking about the use of RjDj during the soundwalk is not limited to the re-introduction of immediacy in the mediated listening experience, but rather that the juxtaposition between mediation and its reclamation of inter-subjective embodied relationships essentially transformed the nature of both soundwalking and headphone listening as micro-cultural systems of engagement. Such an experience is largely defined by the interplay between a subject engaged in mediated aurality, and the sounds created by others with the intent of participating in that experience. In this particular instance of soundwalking, the nature of embodied listening practices mobilised by the portable device present somewhat of a paradoxical scenario for the listening subject, insofar as the mobile device re-integrates and reclaims the immediacy of intersubjective embodied relationships rather than neglects them. It remains an arduous task to articulate a notion so intimately bound to the subject as embodiment without first considering the positionality of the individual to corporeality. The physicality of the subject connotes a vast web of separate yet interrelated attributes, most of which are developed out of an environmental conditioning of social and cultural design. It is exactly this approach that gives rise to the notion of aural inter-subjectivity as an embodied practice, as particular cultural conceptions of the body are framed in relationship to the bodies of others. As such, this paper has considered the malleability of phenomenological perception and thus the notion of embodiment, in terms of its potential to accommodate the need for culturally-contextualised research into mediated aural practice. It is our hope that having developed a discussion concerning a culturally-bound aural phenomenology that considers the historicity of the discursive approaches, the potential for their coalescence, the role of new media and the intentionality of design, we have addressed and presented a point of entry to continue to negotiate the complex terrain of mediated aurality and its relationship to the body. Augoyard, J.F. & H. Torgue (2005) Sonic Experience: A Guide to Everyday Sounds. Montreal, CA: McGill Queen’s University Press. Bijsterveld, K. (2008). Mechanical Sound: Technology, Culture, and Public Problems of Noise in the Twentieth Century. Cambridge, MA, USA: MIT Press. Bull, M. (2000). Sounding Out the City: Personal Stereos and the Management of Everyday Life. Oxford, UK: Berg. Bull, M. & L. Back (2003) Eds. The Auditory Culture Reader. Oxford: Berg. Classen, C. (1993). Worlds of Sense: Exploring the Senses in History and Across Cultures. London and New York: Routledge. Cox, C., & Warner, D. (Eds.). (2004). Audio Culture: Readings in Modern Music. New York, NY, USA: Continuum. Csordas, T. J. (1999). Embodiment and Cultural Phenomenology. In Perspectives on Embodiment: the intersection of nature and culture. New York, London: Routledge, pp. 143-162. Dyson, F. (2009) Sounding New Media: immersion and embodiment in the arts and culture. California, CA: California University Press. Erlmann, V. (2004) Ed. Hearing Cultures: Essays on Sound, Listening and Modernity. Oxford: Berg. Gardner, P. (2008). Mobile Publics: Methods for Making Virtual Spaces Public, In Mobile Nation, Canadian Design Research Network, (Eds). Tuns Press/Riverside Architectural Press. Geurts, K.L. (2002) Culture and the Senses: Bodily Ways of Knowing in an African Community. Berkeley: University of California Press. Haraway, D. (1990) A Manifesto for Cyborgs: Science, Technology and Socialist Feminism in the 1980s, in Feminism/Postmodernism, in Ed. L. Nicholson. New York and London: Routledge, pp.191-195. Howes, D. (Ed.). (2005). Empire of the Senses: the sensual culture reader. New York: Berg. Husserl, E. (1964). The Idea of Phenomenology. The Hague, Nijhoff. Ihde, D. (1976) Listening and Voice. Athens, OH: Ohio University Press. Ito, M., D. Okabe, & M. Matsuda. (Eds) (2005) Personal, portable, pedestrian: mobile phones in Japanese life. Cambridge, Mass. : MIT Press. Jackson, M. (2002). The Politics of Storytelling: violence, transgression and inter-subjectivity. Copenhagen, Denmark: Museum Tusculanum Press. Katz, M. (2004). Capturing Sound: How Technology Has Changed Music. Berkeley, California, USA: University of California Press. Katz, J. & M. Aakhus (2002) Perpetual Contact: Mobile Communication, Private Talk, Public Performance (Eds. ), Cambridge, UK: Cambridge University Press. Kozel, S. (2008) Closer: Performance, Technologies, Phenomenology. MIT Press. McCartney, A. (2005). Performing soundwalks for Journees Sonores, canal de Lachine. In G. Giannachi, & N. Stewart (Eds. ), Performing nature: Explorations in Ecology and the Arts (pp. 217-234). Bern, Switzerland: Peter Lang. Merleau-Ponty, M. (1962) The Phenomenology of Perception. Translated by Colin Smith. London: Routledge. McLuhan, M. (1964) Understanding Media: the extensions of man, New York, NY: Mentor Books. Nancy, Jean Luc (2007) Listening. Fodham University Press. Plant. S. (2002) On the Mobile: The Effects of Mobile Telephones on Social and Individual Life. Report for Motorola. Varbanov, V. (2002) Bulgaria: mobile phones as post-communist cultural icons. J. Katz & M. Aakhus (In Eds. ), Perpetual Contact: Mobile Communication, Private Talk, Public Performance, Cambridge, UK: Cambridge University Press. Varela, F., E. Thompson & E. Rosch (1991) The Embodied Mind: Cognitive Science and Human Experience. MIT Press. Schafer, R. M. (1977) The Tuning of the World. New York: Knopf. Reprinted as Our Sonic Environment and the Soundscape: The Tuning of the World. Rochester, VT: Inner Traditions International, 1993. Schroeder, F. (2008) Caressing the Skin: Mobile devices and bodily engagement. In Proc. Mobile Music Workshop, 2008. Vienna. Werschler, D. (2008) Sonic Signage: [murmur], the Refrain, and Territoriality. Canadian Journal of Communication, Vol 33, pp. 405-418. Westerkamp, H. (2006). Soundwalking as Ecological Practice. The West Meets East in Acoustic Ecology. Hirosaki: Hirosaki University. Biography Vincent Andrisani is a PhD student in the School of Communication at Simon Fraser University. His research is in the area of Acoustic Communication, and he is currently working as the recordist for most recent iteration of the Vancouver Soundscape Project. Milena Droumeva is a doctoral candidate in the Faculty of Education at SFU. With a background in media studies and communication as well as interaction design and auditory display design, her current interest brings together traditions of acoustic ecology and design methods by exploring the mediated aurality of the contemporary urban soundscape.